My blogger friend Catherine has a great post about Taxes. Since the first installment of IRS taxation has just past, I hope you will read her post. 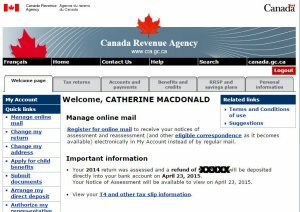 Screen shot of Canada Revenue Agency informing me that my tax return has been assessed and notifying me when my return will be deposited in my account. Taxes: What events do you find “taxing” – taking energy, time, or otherwise being a bit of a drain? Maybe Christmas or Easter takes a lot out of you. Maybe it’s the annual meeting. Maybe it’s gearing up for confirmation. Or maybe it’s something that’s not church-related at all – maybe it’s doing laundry, or taking the car to the shop. The social activities after a long week of ministry. As an introvert, I also find days that have no alone time draining.